Today's featured traveler, Kirk Thomas, will be talking all about his experience in Denver Colorado. Read below to learn about the hidden gems in Denver. Solo vs. Group: who did you go to Denver with? Alone...with a group? What was the purpose of the trip? It was a group trip with a few of my friends from college. We decided to get together and have a guy's weekend, because we hadn't taken a trip in a few years. So this was a chance to catch up on life. Las Vegas and Denver had the best deals as far as flights, rentals, hotels, and events taking place. Since none of us had been to Denver before, we decided that would be the place to go. 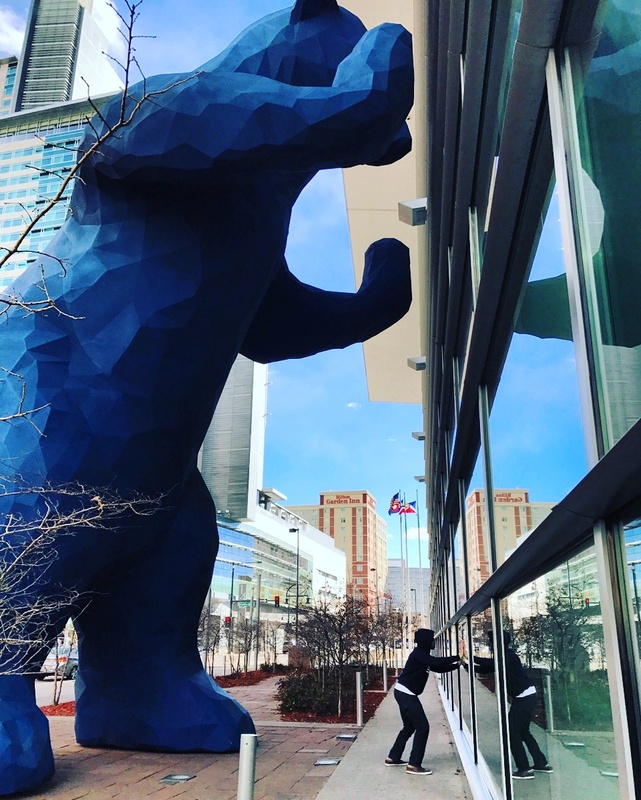 Attractions: what are some must-see places to visit in Denver? Denver is a quiet city with a lot going on if you know where to look. For sports fans, it is one of the fewest cities to host all five professional sports in the city (NFL, NBA, MLB, NHL, and MLS), giving you an entire years worth of events to go to. I went to a Denver Nuggets game at the Pepsi Center while I was there and it was a completely different atmosphere than my hometown's (Dallas Mavs) games. We stayed at the Hyatt Regency downtown next to the Convention Center, so the closet thing to us was the 16th Street Mall, which was a mile long strip of stores, restaurants, bars, lounges, and other attractions. I would recommend staying in the area for anyone looking to step out at night. Food: Top 3 restaurants in Denver? Quick disclaimer, I was in Denver for five days and gained about 12 pounds. So if you are a foodie, this is the place for you. 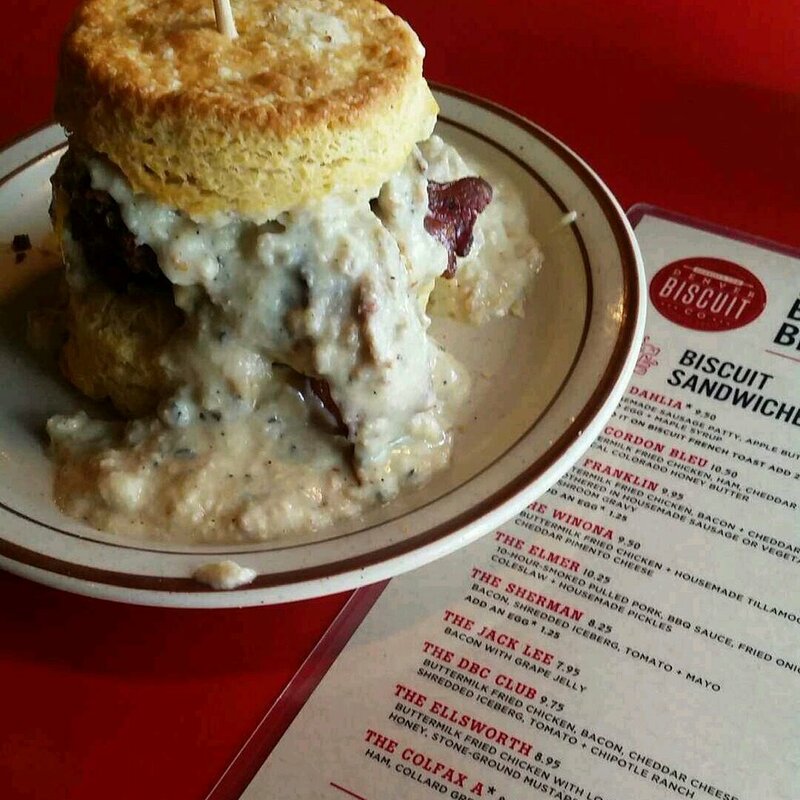 The next three words I tell you are about to change your life... DENVER BISCUIT COMPANY! I can hardly put into words how amazing the food at this place was, but I think the fact that I ate there three out of the five days should say enough. I ordered The Franklin, which came with a huge biscuit, topped with fried chicken, bacon, cheddar cheese, sausage gravy, and apple butter. It's even better than I made it sound. We also ate at Sunny's for breakfast, which had a real "back home" vibe to it, and Guard and Grace Steakhouse if you are looking for a more formal evening. But honestly, once you've tried DBC I guarantee you'll be happy with your decision. Off the Beaten Path: did you travel to any places that most people may not know about? If you love the outdoors, Denver is the city for you. Located just a few miles outside the city limits are a number of snowcap mountain trails that you can hike or drive to the top of. My two favorite have to be the Amphitheater and Lookout Mountain. The Amphitheater is a main tourist attraction, hosting a number of concerts there throughout the year with an over 9,000 seat capacity. Not for those with a fear of heights, at an elevation of over 6,400, those who make it to the top are treated with an amazing view of Downtown Denver. For something a little more hidden, you can try to find the top of Lookout Mountain. This is a hidden mountain trail located Northwest of the city, off HWY 70, with the closest landmark being the Mother Cabrini Shrine. If you can find your way to the top, you'll be greeted with a magnificent view of untouched nature and a vast expansion of mountain ranges. did you do anything else on the trip? Of course we're going to smoke pot if we go to Denver, it's only right. It's not hard at all to get weed in Denver, as long as you have a valid ID. The two best dispensaries I went to were Starbuds off of Brighton Boulevard and Denver Dispensary off of Vasques Boulevard . They have everything from vape pens to edibles to THC juice. The higher grade strands will of course be more expensive, but one of the best things about these dispensaries is that they sell shake at a discount. You can get an 1/8 of shake for $25, and for all my stoners out there, we know that's a hell of a deal. We actually planned our trip around the Cannabis Cup on 4/20 weekend, which is pretty much the Super Bowl of weed growers. The Cannabis Cup was a life changing experience. It's the only event where I have seen literally every different background get along. The soccer moms were hanging out with the Rastas. The bikers were passing blunts to gay guys. CEOs were dancing with the ratchets. It was a beautiful scene! It didn't hurt that we got to see concerts from Rick Ross, ASAP Rocky, 2 Chainz, and Snoop Dogg, too. Transportation: did you rent a car while you were there...or was it easier to get around by bus and/or Uber? Every time I go to Denver, I have gotten a rental car. Denver is a pretty widely spread out city, so I never had to worry about finding parking. One thing that I would recommend to anyone renting a car in Denver is to get a car with four wheel drive and snow tread on the tires. I have driven in the ice and snow there and it is not something you want to do with ill-equipped tires, especially if you aren't used to doing this type of driving. Plus, if you want to go exploring the mountain ranges, you'll definitely want to have your own car to do so. Nightlife: did you go out to any bars or clubs in Denver? And if you did, what would you recommend? I'm not much of a club goer like in my younger days, but I hit a view lounge while I was out. Denver has a very vibrant music and performance scene, and a ton of creative people who make classic songs their own. The best spot I went to while I was out there was Henry's Tavern in the 16th Street Mall area. The night I went, there was a live jazz band playing and vino specials all evening. Very classy establishment. Also, the strip clubs in Denver are terrible, and you can't even smoke weed inside them! Needless to say, I was highly disappointed. Funny stories: any wild stories that you can share with me? Two funny stories from my trip: We landed at the Denver airport and got to our rental car. As we drove into the city, we noticed a very distinct smell of weed in the air. It was funny because every single person noticed the smell and we all looked at each other to see who had snuck a blunt with them on the trip. The second, and most awesome thing that happened in Denver, occurred during Cannabis Cup. While we were charging our phones in the auditorium a group of guys came and sat down next to us and needed to recharge their phones as well. We sparked up a conversation with them when suddenly people starting approaching them, shaking their hands, and congratulating them. We then found out that these guys had come in second place in the Cup for Best Sativa. One of the guys then pulled out a bag of their strand, and I kid you not, the hairs on the bud were as orange as a tiger. Then, the man proceeded to reach into his bag, grab out a handful, and give it to us! "Enjoy the rest of the Cup." he said as they left. Let me just say that smoking that strand was an experience. Opinion: in your opinion why should people travel to Denver? 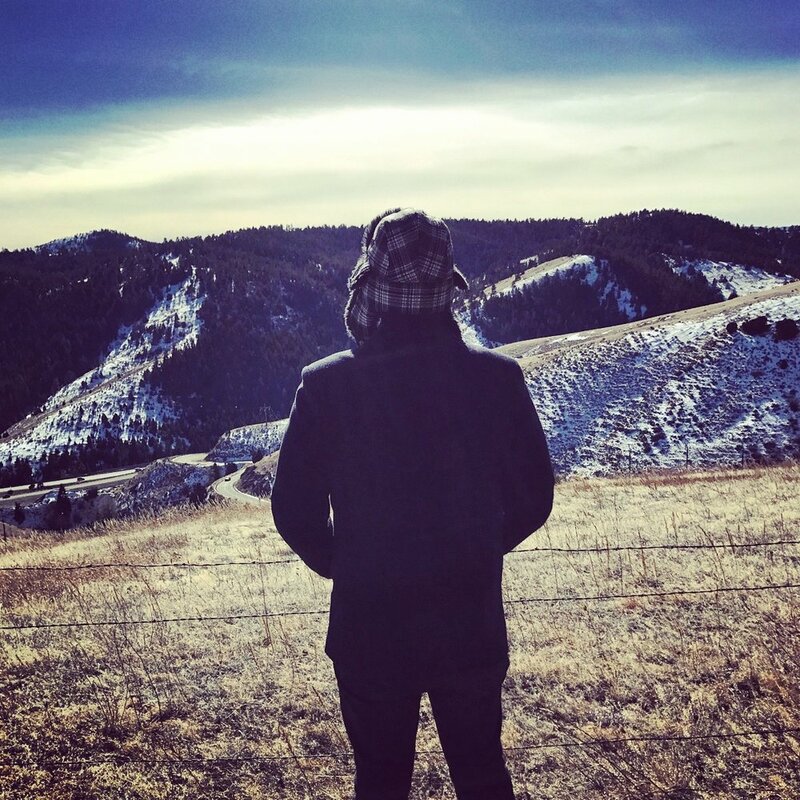 If you are looking for a break from the fast pace life of city living, want to enjoy the wonders that nature has to offer, and don't mind the cold, Denver is the place for you. Flights to Denver are usually cheap, making it a great, easy, and cheap getaway trip, whether you are solo, a couple, or with a large group. From art galleries to music events to amazing food, you can find anything to satisfy your sense of adventure while there. Contact Information: how can my readers reach you? You can contact me at TheTXGentleman on Instagram, Kirkland Allen Thomas on Facebook, and www.youtube.com/hareandbearproductions, where we will be launching a sketch comedy web series in February.